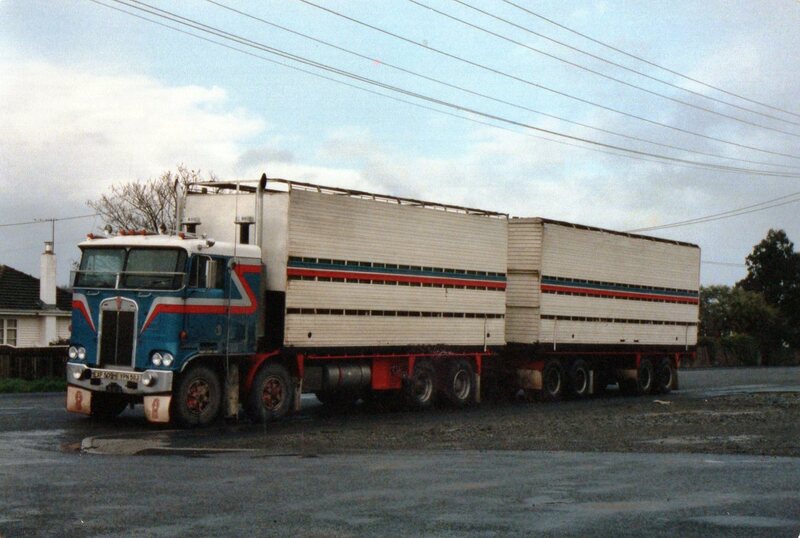 Big Chill Distribution has its roots in a one truck company carrying pies between Auckland and Tauranga in the 1990s. Today they are a nation wide chilled freight company operating rigs like this Volvo FM Globetrotter. Brenics is a South Island company that now has depots in the North Island, including Palmerston North. It specialize in the cartage of fresh fruit and vegetables and other food items. This Isuzu has its curtains in the livery of the Yummy Fruit Company. 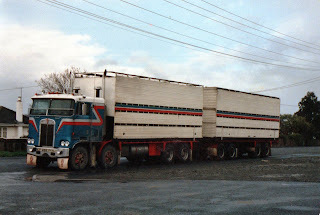 N & M Jongeneel transport is another Palmerston North based company who haul chilled fresh products. Turners & Growers is a distributor of fresh produce throughout NZ and the world. 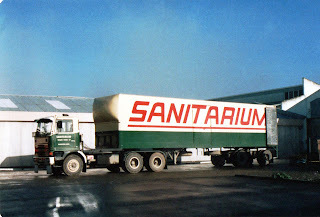 An International in its colours pulls a chilled curtain-side with livery promoting Jazz apples. A Strait Freight Kenworth pulls a pair of refrigerated vans in an alternative B-train configuration. Whereas the usual B-train has its fifth wheel for the second trailer mounted out behind the first trailer, this set up has the fifth wheel mounted in underneath the first trailer. Rather than the pin of the second trailer being mounted under the body, it is mounted on a tongue extending ahead of the trailer. 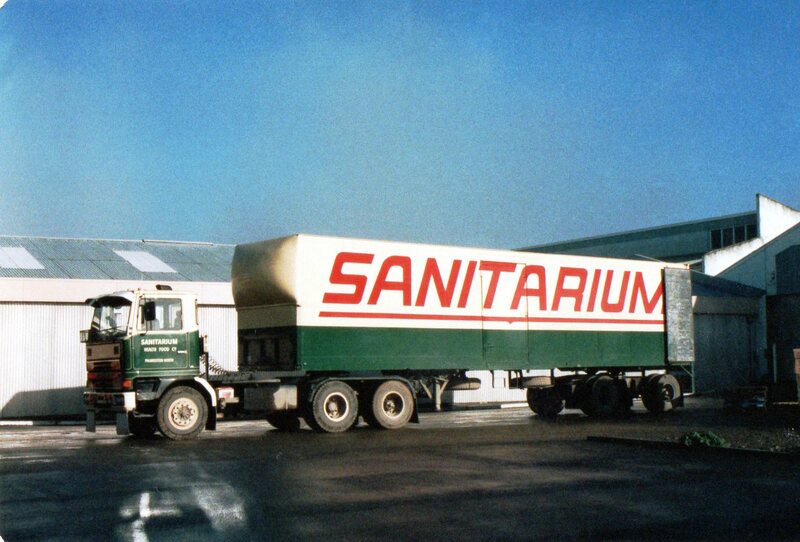 As can be seen in this photo, the tongue is painted bright yellow to lessen the chance of it being walked into when the trailer is parked alone. 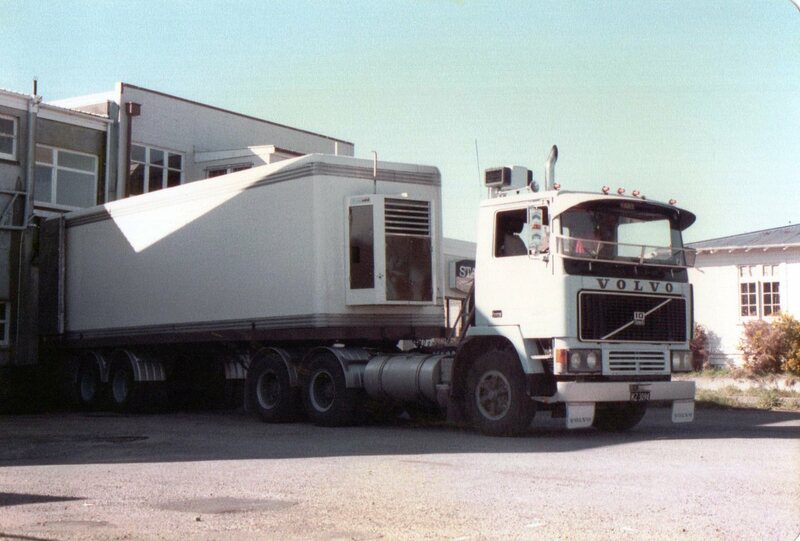 A Yummy Fruit Company Freightliner Argosy with 4 axle refrigerated van. Britton's House Movers, Mack Superliner. Castlepoint Station's Commer takes a break in Masterton. 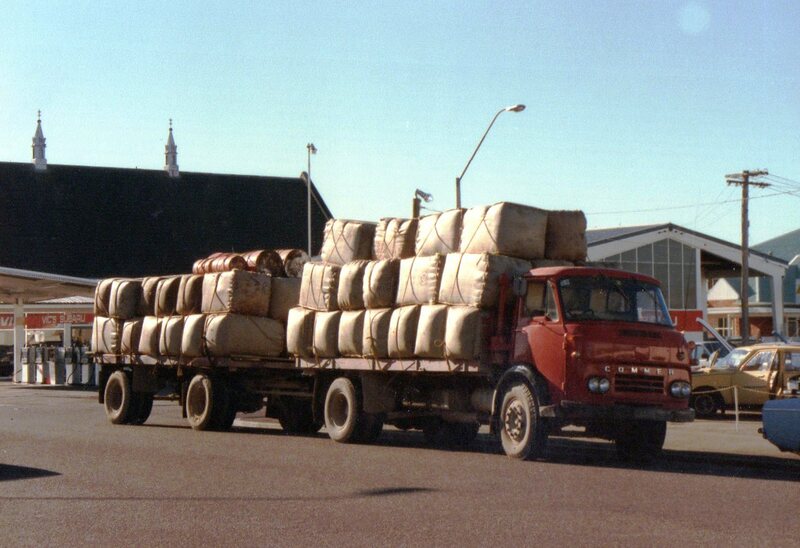 The TS3 has just hauled this load of wool 60 odd kms over a road of many corners and steep hills, so the driver may have got out to rest his ears. 8V71 powered TM Bedford of Saintarium Health Foods unloads at Moore Wilson's warehouse in Masterton with the winter sun low in the sky. 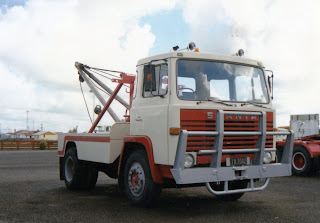 A very neat little Scania LB80 tow truck from 1972. 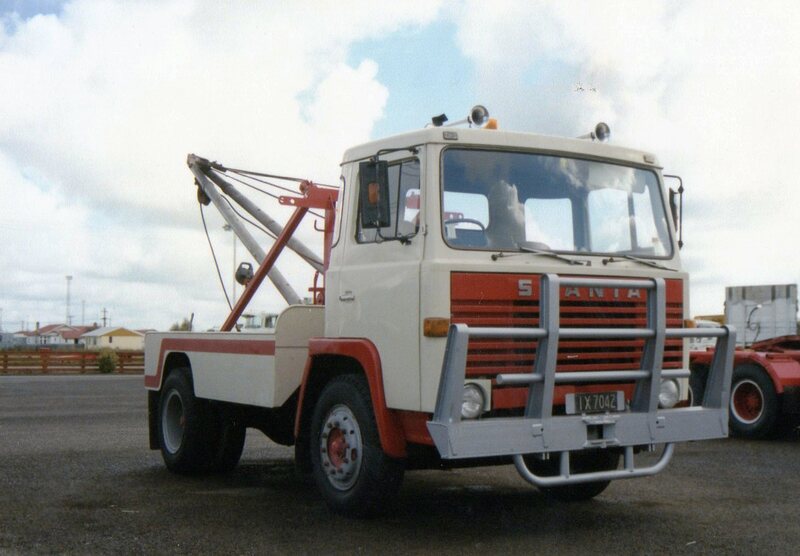 Lightweight tow trucks often don't clock up the kilometres very quickly, so I wonder if it is still on the road. 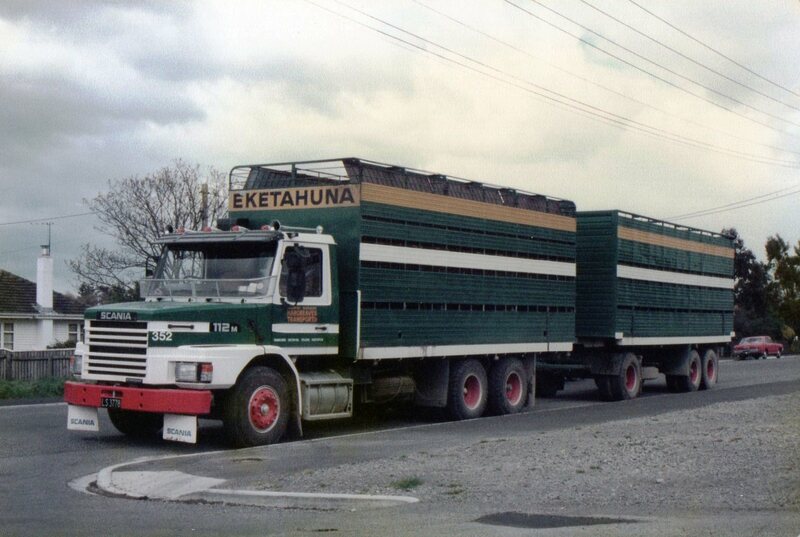 Scania T112M from the Eketahuna branch of the large Hargreaves fleet. 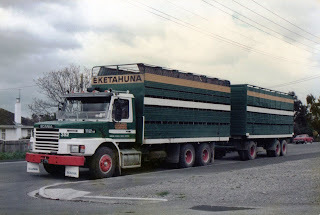 Volvo F10 with skinny day cab unloads from its refrigerated trailer at McLay's Meats in Upper Hutt. 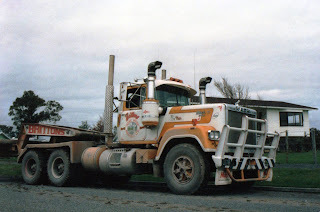 Kenworth 8 wheeler of David Pope, Masterton.